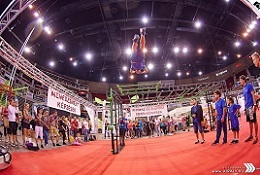 We had bodyweight training or as it recently called calisthenics for years in Twins, that's why we are glad to see bodyweight training is living its renaissance thanks to street workout and convict conditioning. Our gym is equipped in order to fulfill the requirement for street workout. That's how we could achieve that in the same time 15-20 person can train without any problem. 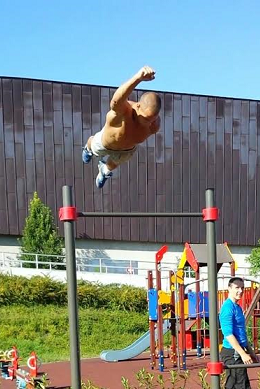 It is a big step for us that we could open our outdoor street workout ground in the summer of 2015. The outdoor training ground gives a unique experience thanks to the landscaped environment and the 1936 built building. Our trainers are among the best street-workout contestants, everybody is young, motivated and prepared competitor, and excellent teachers. Our workouts filled with uplifting laughs. "It's very motivating that boxing trainings are held at the same time, atmosphere is good, trainings are hard but everybody is really cool: joking, "blood sucking" with big laughs." "...As nowadays the weather is fine, the workouts take place in the garden feeling the light warm breeze during the exercises - and when the weather is bad we are inside the building." "The vibes are just as good as we are having a party with my friends on the trainings. However, at the end of the session I feel every tendon and muscle fiber of my body." Street-workout using the basics of calisthenics has started its journey from the United States, as a simple and clean self-weight workout form, which conquered the whole world recently. The basics of street-workout are the followings: pushups, pulling and pushing but at advanced level it is filled with acrobatic or freestyle elements making the movements more dynamic. Workouts can be done alone but it more enjoyable in company. Who tries it usually will be so fanatic with the own bodyweight trainings that their life-style will be built around it. Street workout is that popular nowadays that world championships and word cups are held as well where in the last few years, Hungarians participated successfully. There is no need for registration on street-workout courses. Simple training clothes will be needed.